The sole purpose of this website is to promote Lake Tekapo and the Mackenzie as a tourist destination. In doing so the website provides information about the area, the scenery and the people who live here. To be able to cover the running costs of operating this website, Tekapo Tourism provides for paid listings. These listings provide additional detail about the businesses they list. 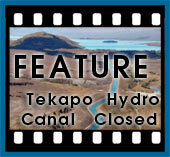 All advertisers on this site must be related to Tekapo and its role as a tourist village. There are two levels of paid listings. Simple listings on the Accommodation, Activities and Winter pages, are available free for Tekapo based businesses. Limited to 1 per business. A comprehensive listing within this website consists of a full webpage dedicated to your business. The page will link off the related page, such as Activities, Accommodation, Winter, Weddings, etc. A banner image of 700 x 200 pixels at the top of the page (as used throughout this website). 3 additional images 250 x 188 pixels in size. Text description of your business. Free 'disposable' laketekapo.net.nz e-mail address for listing on the page for protection from spam if required. Please include the page you wish to advertise on within the message.